-Why? I do not fit in a match box. -Ha! You sound like a Gemini..."
Of course I was. And so what? Teased, I took on to dethrone astrology. It should require no more than a few days of study... And instead, I became an astrologer; while studying Veterinary Medicine, and music, and acting, and dance, and photography, and Tantra, and 14 languages... as the surrendered Gemini I became. Surrendered? With a twist. I called my technique Astrology Healing: as an astrologer, I was not interested, at all, in locking you into the prediction of your "future". Why should anyone? Just the opposite was my purpose: showing you your strengths, from which you could fight or even ignore your weaknesses. Cultivate your lucky Jupiter and healthy Mars, if a severe Saturn hindered your path. Free-will was what I wanted to boost in you so that you could live the life you dream of, within the astonishing character that you were given. Within fifteen years of this work, intuition became such an overwhelming tool in my readings that Soul Boxing was born. A technique based on observation and direct read, some questioning, leading to ride to a complete shift of reality. As we meet, I stand much of the time in what I call sensing mode, a mild meditative state from which I can silence my own and receive you fully. Sometimes, I invite a meditation with you, guided or not, depending on your experience. If I guide it, I created a chakra alignment theme that helps you reboot and starts you at the right place. The unfolding is usually cathartic and irreversible. Most of my healing work requires 2 to 4 hours. It can last two days. Or I can take it to the mentoring level. Sometimes, as little as 30 minutes can veer your course toward freedom. I have never charged so far for healing work. OK, in January 2014, I received a $100 dollar bill that was so strongly handed to me that I feared the energetic consequences of refusing it, for my client. And in March 2014, I received the gift of an amazing vacation in Mustique Island that I simply could not refuse. I am a healthy human. What if healing were a matter of adopting a constructive and freeing perspective about matters in our lives instead of dwelling on limiting and destructive interpretations? What if someone helped you see the choice that limits you, showed you a constructive perspective, and moved you to adopt it irreversibly? Shortcut to a lifetime of wallowing? Alternative to 10 years of Therapy? No? Yes? I do not know. As long as you have time and money. And that the therapist actually interacts. Why would your justifying monologue be more transformative if someone sleeps in front of you? But still, I am very curious about therapy. I am a gemini. Remember? And a natural gift for seeing you, allow me to read your choices and how they opacify the fluid expression of your natural beauty and of your desires. The strength of Soul Boxing is its firmness. Consciously or not, we all know what hinders our joy and feeling of bliss. We know our own tricks, justifications, bias interprétations, etc and if someone helps you slam the hammer on the rising auction of your own indulgence, you can finally get to work. 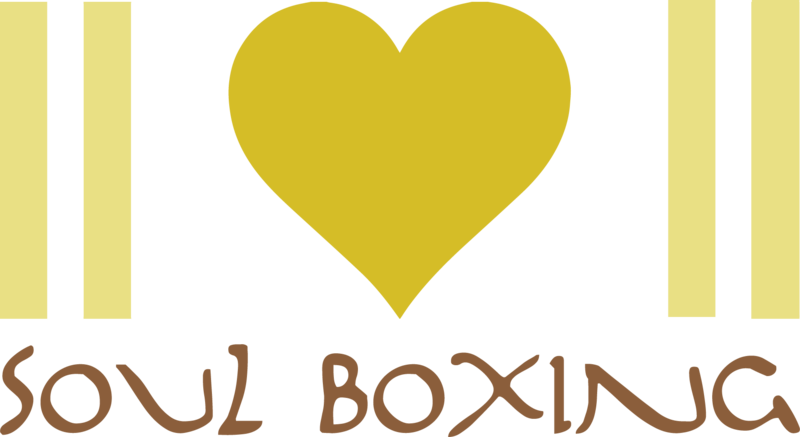 The firmness of Soul Boxing is true love. It does not judge or condemn. On the contrary, it understands; but makes sure to toss the card castle of too many years of sameness and stagnancy. Seeing the past through a new scope of honesty, and letting it go; letting that clutter become compost for the earth; she knows to make forests and rivers with that. Loving the inocent child in you now and for ever, and mustering the courage to change with a clear plan. The decision to adopt a new perspective becomes evident, elated, irreversible. Comes the feeling of responsibility toward our own and the people who love us. Comes the time to nourish consciousness and gratitude toward Nature who gave us ALL THIS. The crystal pure child in you may not hide or play small any longer. Opening wide windows and doors, blowing the roof of your expression, free the child to the light, surrendering to your awesomeness is no longer a choice. It is a responsibility. Come and be a full participant to the works of this planet. Help me with the destiny of our children.